The Call: DL, tenor sax; Bob Moses and Jeff Williams, drums. 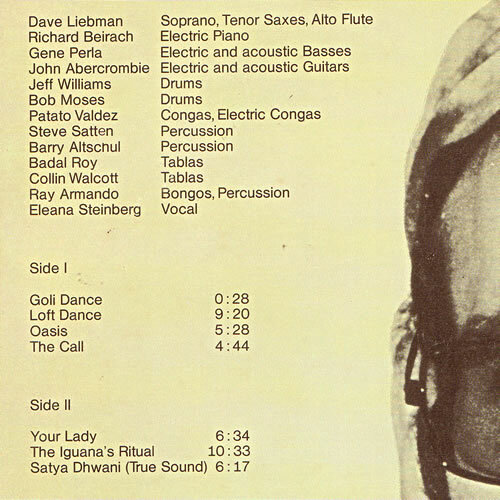 Satya Dhwana: DL, alto flute; John Abercrombie, guitar; Badal Roy and Collin Walcott, tablas. So when one sees the percussion-heavy line-up on Drum Ode, recorded late ’74, it’s not hard to imagine where the inspiration came from. Echoes abound — not least the heavy echo on Liebman’s horn itself in “The Call.” The double-drumming sets a martial tone that quickly slides into heaving backbeats, charging forward under Liebman’s full-throated flight. More of a nod at, rather than a straight cover of, the Henry Grimes tune. Different story altogether on the rather lovely “Satya Dhwana,” which follows a rubato Abercrombie opening with a flute/tablas combo supported by guitar accents. There’s the slightest hint of pachouli in the air, but Liebman, Roy, and Walcott work together beautifully, forging an East/West hybrid that is miles away from the roiling skronk of Magus.